From a Plants and Planting Design course, Capel Manor, Enfield. Bees visit the tiny PINK flowers of this perennial, known for its decorative foliage. 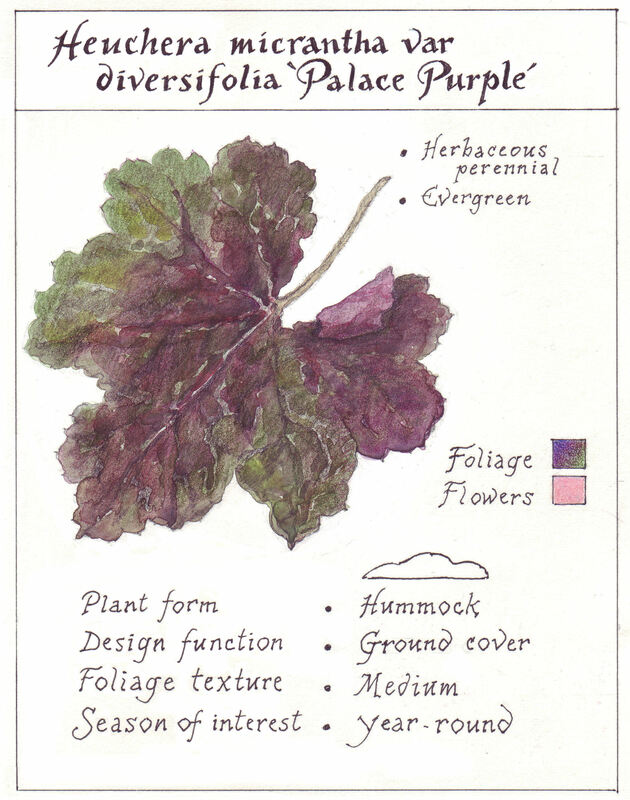 Ours, ‘Palace Purple’, was a gift from Anne and each leaf is a work of art. 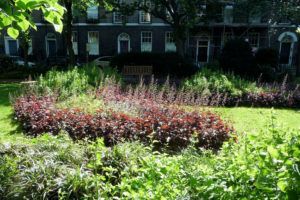 Other cultivars : ‘Chocolate Veil,’ ‘Raspberry Regal’, ‘Green Spice’ and ‘Quilter’s Joy’. 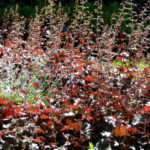 Heuchera is easy to grow. RF had it next to his tiny lawn for years. Its rootstock does tend to lift itself higher each year, so mulching is advised. 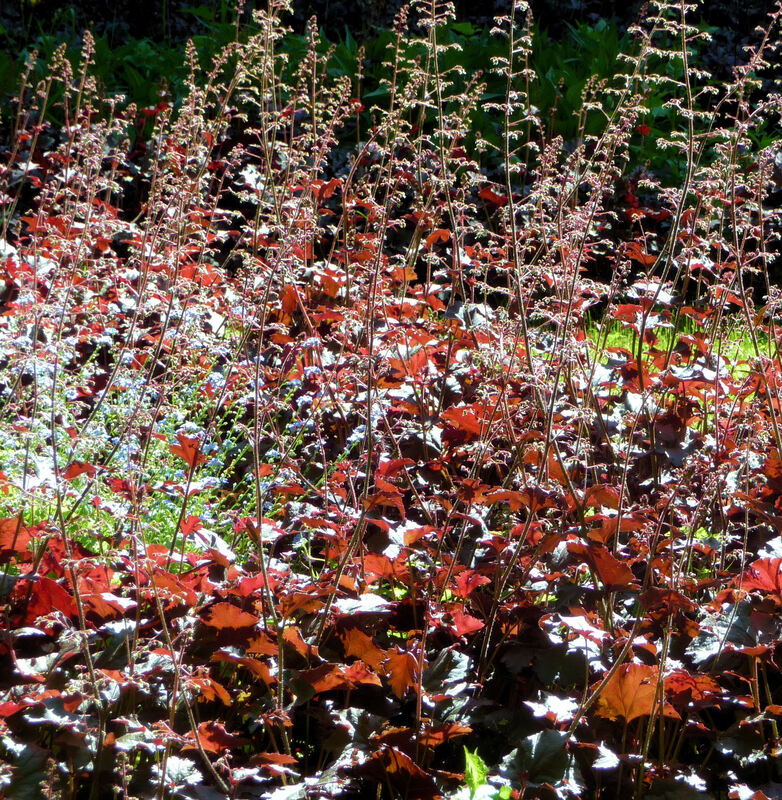 In early March Vine Weevil grubs were found in the soil of our container-grown Heuchera. They had eaten away most of its roots. 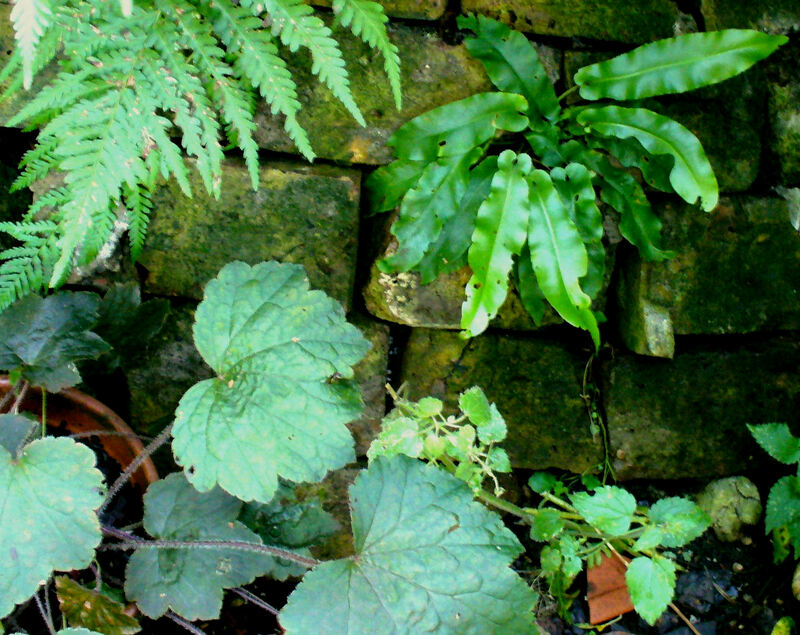 The photo, far left, is of a Vine Weevil on the side of our house last year. Its identity was discovered weeks later. Even had our birdlife made a meal of it, the adult weevil might already have laid its eggs in one or more of our containers. 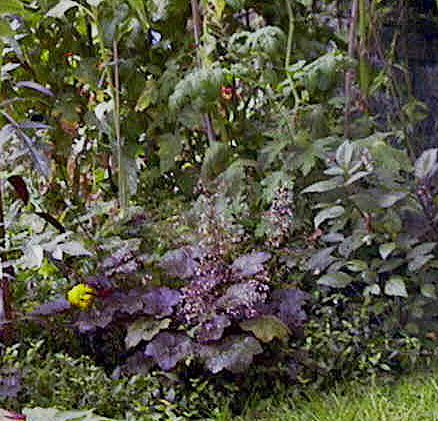 The greatly enlarged photo of one of the grubs in the Heuchera pot was taken before it was fed to the birds. 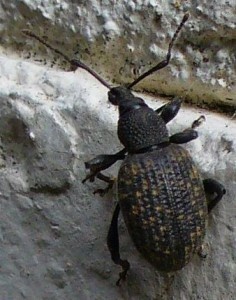 On the internet, two chemical treatments for Vine Weevil containing Neonicotinoids were listed as available to the gardener. This was after a two-year EU ban on these pesticides, following research into what’s been killing our bees by Prof Dave Goulson of the Bumblebee Conservation Trust. Unlike many insects in our Creature Feature, Vine Weevils should not be ignored and left for the birds to eat. They lay their tiny eggs on bare soil not covered with sharp grit. 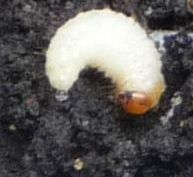 By springtime these will have hatched and the grubs eaten through the roots of the plant, and they do have their favourites… Covering bare soil in containers with gravel or grit will deter the weevils from laying their eggs, and may save your plants. Here is the recovering Heuchera. It lives again. 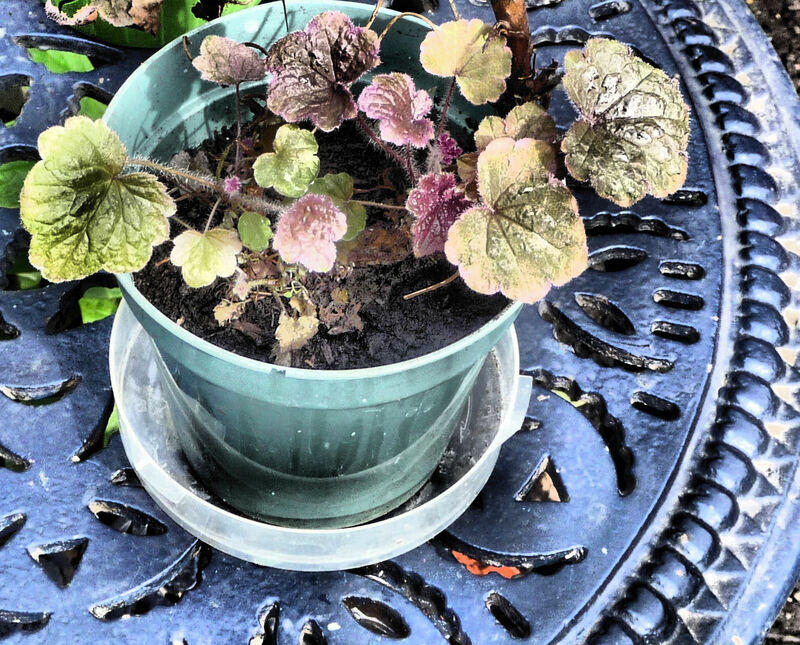 It was taken from the weevil soil before it dried out, washed, planted in fresh soil and kept in the kitchen window. After several days it showed signs of life. The weevil soil was put in the gardening recycle bag to be taken away by the council. On Gardeners’ Question Time, 28 March 2015, Bob Flowerdew suggested plunging any Vine Weevil-infected pot of soil into a bucket of water and leaving it there for a month. Definitely kinder to the environment than using a product with Neonicotinoids.